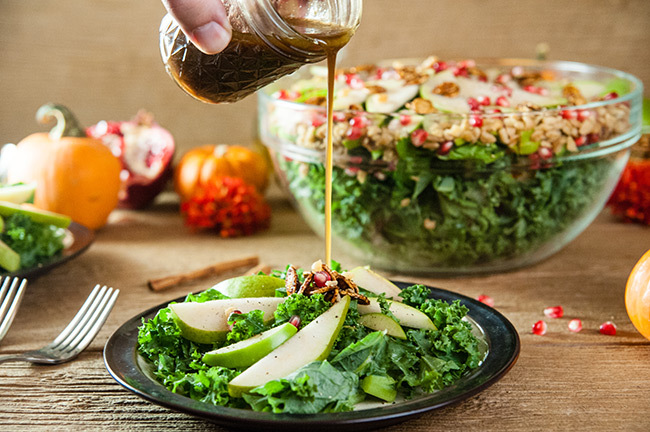 Apple and pear kale salad with maple dijon vinaigrette is the perfect fall salad for a healthy and delicious lunch. 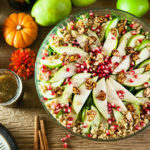 This elegant fall salad recipe would also make a lovely appetizer salad for Thanksgiving dinner. 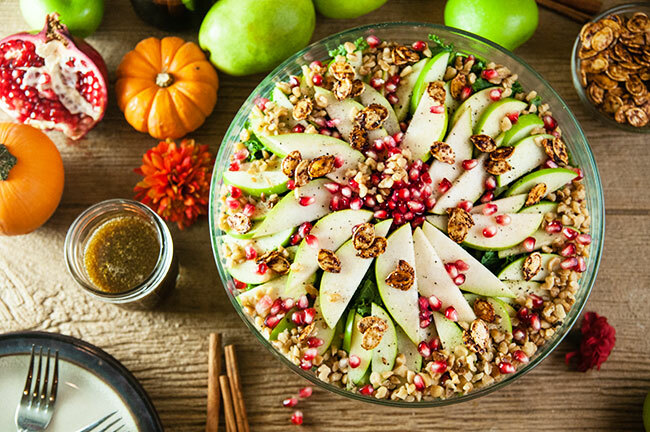 Loaded with kale, apples, pears, pomegranate and roasted pumpkin seeds, this salad is a healthy way to enjoy the flavors of the fall season. The maple dijon vinaigrette finishes the salad off with a sweet, flavor filled dressing so fitting for the season. Will you hate me if I talk about the holiday for a hot second here? I know it’s October and we are still knee deep in the season of pumpkin everything, but guys the holidays are right around the corner. And in fairness this apple and pear kale salad does have a roasted pumpkin seed component so there you go. 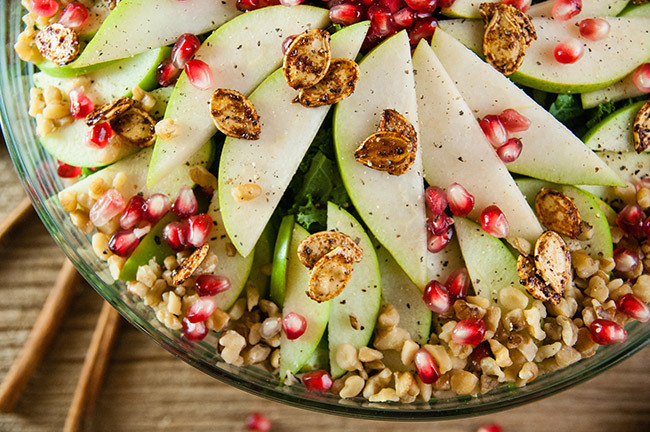 So what does this salad have to do with the holidays? I think it would be an excellent starter for a holiday meal because it is just so pretty. And it doesn’t feel too early to talk holidays. This past weekend, I had the pleasure of having an impromptu gathering at one of my high school bestie’s houses with another of our best friends. Are any of you still friends with your high school friends? There’s something wonderful about staying in touch with the people you’ve come of age with. We’ve definitely grown up together now and seen each other through all different phases of life, from our trying to figure it out early 20s to navigating parenthood and raising tweens as my one friend now is. Somehow, we decided that this year we are going to do fun holiday things: pumpkin roll day and Friendsgiving. I am so psyched. Now I’ve done pumpkin roll day with one of these women before and it was super fun but we’ve never all done Friendsgiving together. Technically we still aren’t all doing Friendsgiving together because one of us lives clear across the country but 3/4 of us isn’t bad. Our menu for Friendsgiving isn’t nailed down yet, but when we talked about it we knew we wanted to do fall food, but probably not turkey. Just lots of other fall type stuff. 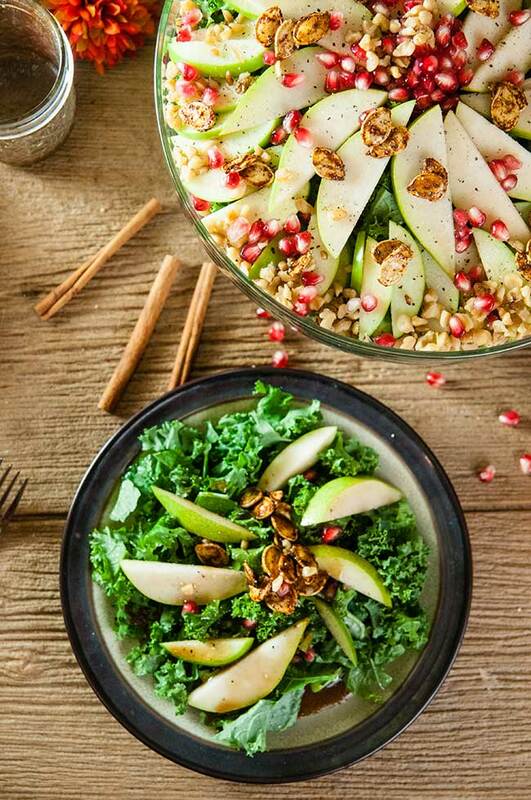 This apple and pear kale salad with maple Dijon vinaigrette would be the perfect starter for a Friendsgiving. Not super traditional but still full of fall flavors. Elegant but easy. Plus, it’s so delicious. 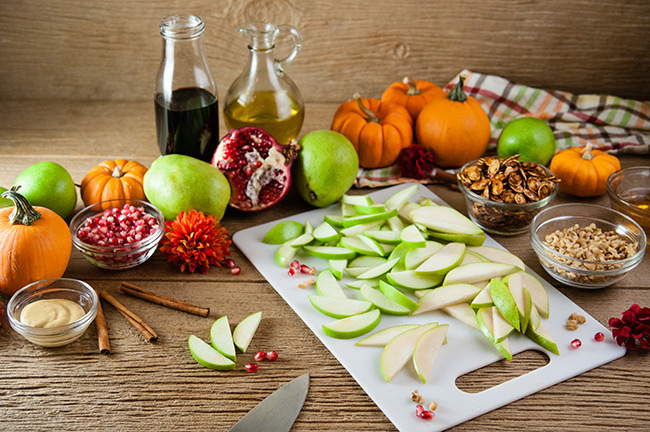 It’s got the best flavor combo of tart from the apples and pomegranate seeds, refreshing from the pears. Plus it’s a little zippy from the sweet and spicy roasted pumpkin seeds. And the dressing? OMG I could drink it with a straw or eat it right off a spoon. It’s sweet from the maple syrup but balanced out nicely with the Dijon mustard. Think an upgraded honey mustard dressing. 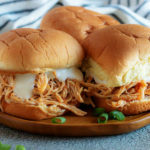 Now that we’ve covered flavors let’s talk texture. 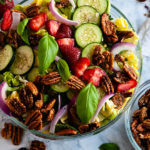 This salad has so much of it! 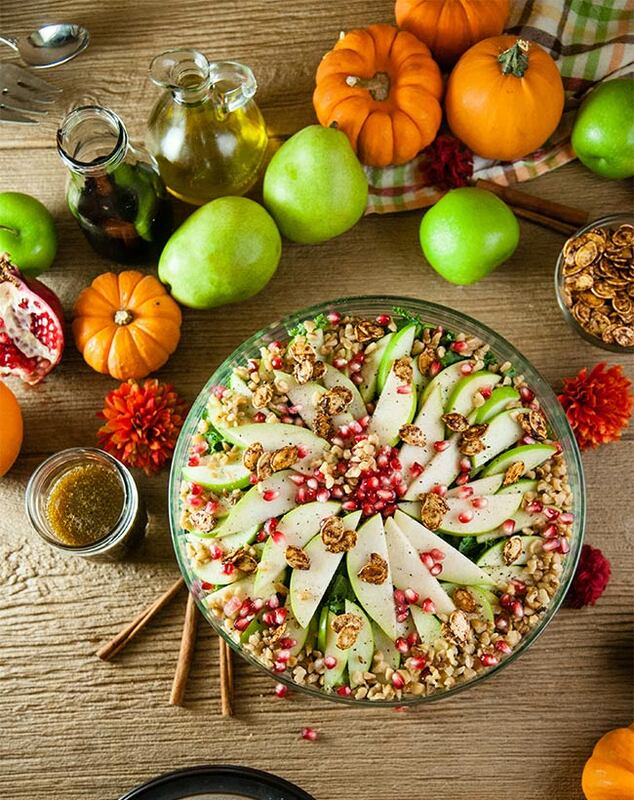 All the crunch from the kale, apples, and pumpkin seeds. A little bit of soft firmness from the pears. A juicy burst from the pomegranate seeds. It makes it feel so hearty and satisfying. Wash the kale thoroughly. Kale tends to have a lot of grit stuck in its leaves and if you leave any on it messes with the texture. Use a nice tart apple. I prefer Granny Smiths in this for both the firm texture and the tart taste. Feel free to make your sweet and spicy pumpkin seeds ahead of time. If you don’t pour dressing on the whole salad it will hold up remarkably well in the fridge. Just toss the sliced fruit in a little lemon juice to prevent browning. Toss all the ingredients for the salad together. When salad is assembled, whisk all the ingredients for the salad dressing together until combined. Enjoy. 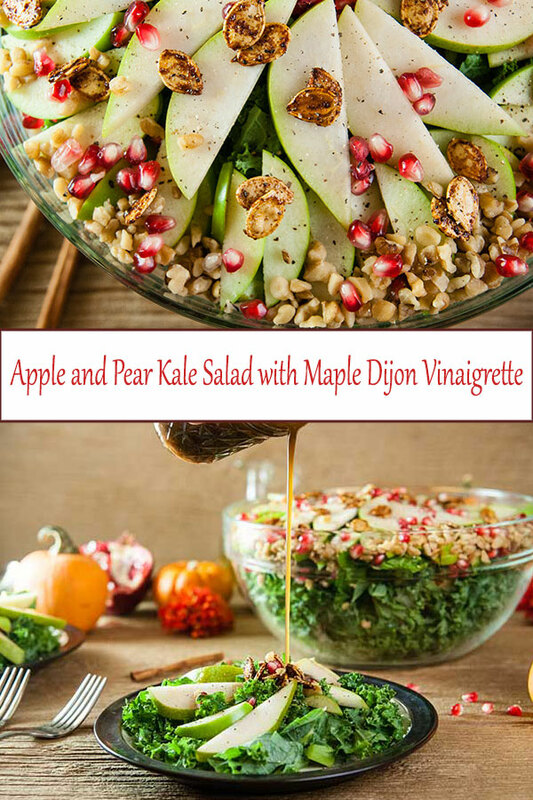 Shop this Apple and Pear Kale Salad with Maple Dijon Vinaigrette recipe! Wow this is gorgeous and looks so healthy! I’m adding this to my “list” for the week. Thank you! 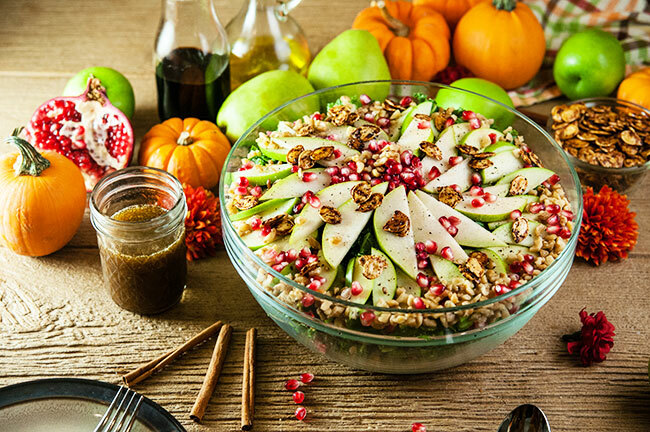 What a great fall salad that’s hearty, festive and flavorful. I’d love to make it this weekend! 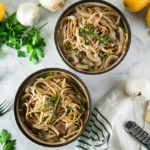 I made something similar the other day and that was delicious, so I am sure this is equally yummy! This looks so delicious and colorful! Yummy! 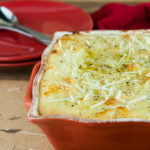 This is such a lovely fall recipe! Thanks for sharing!